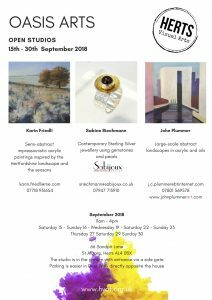 I am once again very excited to be exhibiting together with my colleagues John Plummer and Sabine Riechmann through Herts Open Studios. We hope you find a little time to visit us. All very welcome. Karin Friedli is a contemporary artist painting modern landscapes. Subscribe to my mailing list to get the latest news from my blog.